It’s been a busy week of cheese making, visiting creameries and farms. I wanted to take one day out to make due on learning how to work on my car from two weeks back when a snowstorm got in the way. 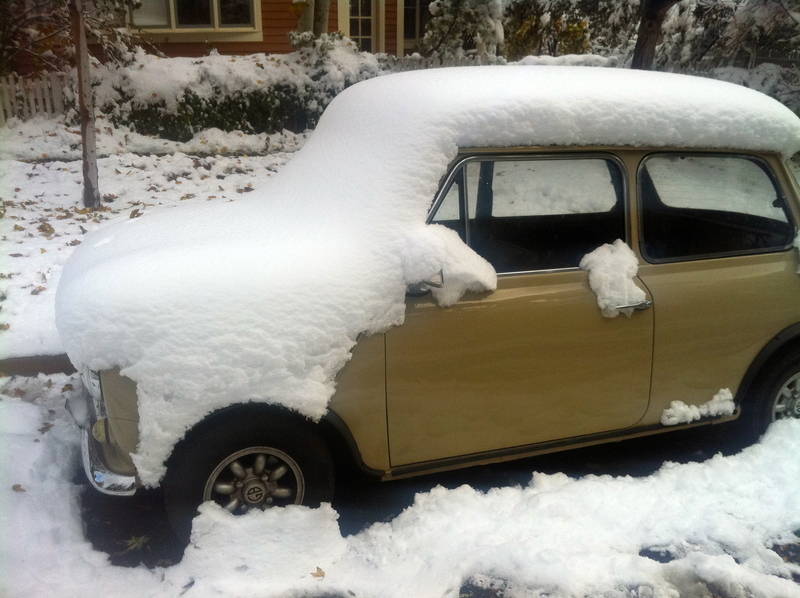 I’ve owned a classic 1973 Mini Innocenti (Italian) for 2 years now. It’s my day-to-day car. Originally I bought it because I liked how it looked and it was fun to drive. To be a real classic car owner though I think you need some understanding of how your car works. For me, part of that is truly knowing the car I’ve become very attached to better and part of it being able to better trouble shoot as problems arise (which they do). I planned to go Wednesday but as I tried to start my car it wouldn’t turn over. Good timing! I relied upon my incredibly smart AAA investment to have it towed over to the shop. Early Thursday morning I headed over to Arvada, CO to Sports Car Craftsmen, a shop that specializes in classic British automobiles. (They don’t turn up their noses at Little Buddy even though he’s Italian.) I intended to just spend a bit of time learning routine maintenance on my car and then getting out of their way. Luckily, Ted, the wonderful and patient craftsman who works on my car, was kind enough to teach me a whole lot more about how my car works. Ted grew up in Boulder and was bitten by the car bug early on. He sees it as dangerous passion that leads to obsessively working on them (because you don’t trust someone else to) and finding yourself owning more than a handful before you know it. He started out showing me how to remove the oil filter and drain the oil. His one complaint with the mini is how packed in everything is in the engine. 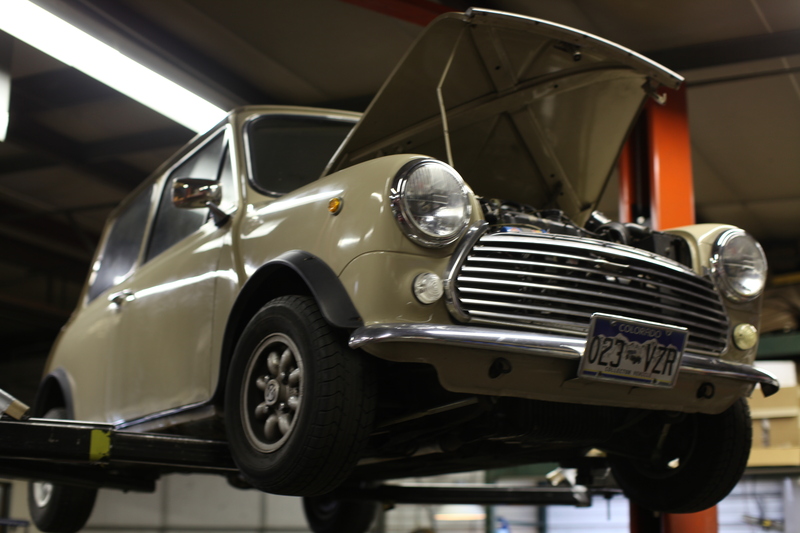 To achieve such a small car, that still runs, things under the hood get crammed in there in undesirable places for maintenance purposes. Ted mentioned it often elicits choice words as he’s working on it. I guess having a woman around the shop cleans things up a bit. While there were a few old timers hanging around Ted said the ladies don’t show much interest. I think I was a bit of a novelty to have around. Part of this project is swallowing any pride you have sometimes and just admitting you know nothing. Ted quickly saw how rudimentary my knowledge was. (I’m embarrassed to admit I didn’t even know how many cylinders my engine was.) I felt that auto shame creeping in. I’ve always felt uncomfortable in auto shops and out of place with my lack of knowledge. Often it wasn’t just me feeling the way but how you’re treated by some of the people who work there. I’m lucky to know Ted. He made me feel at home and enthusiastically took me through how my engine works with no judgment. Before when I would look under the hood of my car I saw a jumble of foreign objects, having no idea what they did or how they related to one another. Ted walked me through everything from how the car starts to what fuels it to what puts it in motion. Normally I shy away from trying to figure out mechanical things because it just seems foreign to me, but after just a day of learning what the parts do and how they interconnect I have more confidence that I could learn this stuff. There is a logic to it all. One of my favorite aspects of this project is being around people who have mastered a craft. Ted and I grabbed some Indian food for lunch and I shared how envious I was of his work. My work has always had a huge level of subjectivity to it where I never felt I was really mastering anything. Everything was a collective effort so there was little authorship over my work. There is a logic to what he does and a beautiful result he has ownership over. I don’t know if I’ve been bitten by the same bug as Ted, but I have had a strange desire over the past few days to take apart my engine and put it back together. I may stay on the safe side and wait until my next trip to the shop. At the very least, now I’m not so afraid to look under the hood. Little Buddy must have gotten wind of my plans to work on him this week and willed up a snowstorm to prevent it. We’ve received our second foot of snow for the season. I do have to admit he looks cute with the new flat top. Unfortunately I am going to have to postpone my maintenance lessons until next week which will coincide with beer making. I will do my best not to mix the two. In the meantime, since it’s one of those stay cuddled inside kind of weeks I thought it would be fun to transition over to some candle making. I don’t have a fireplace to stay warm next to, so the soft glow of homemade candles will have to be the next best thing. 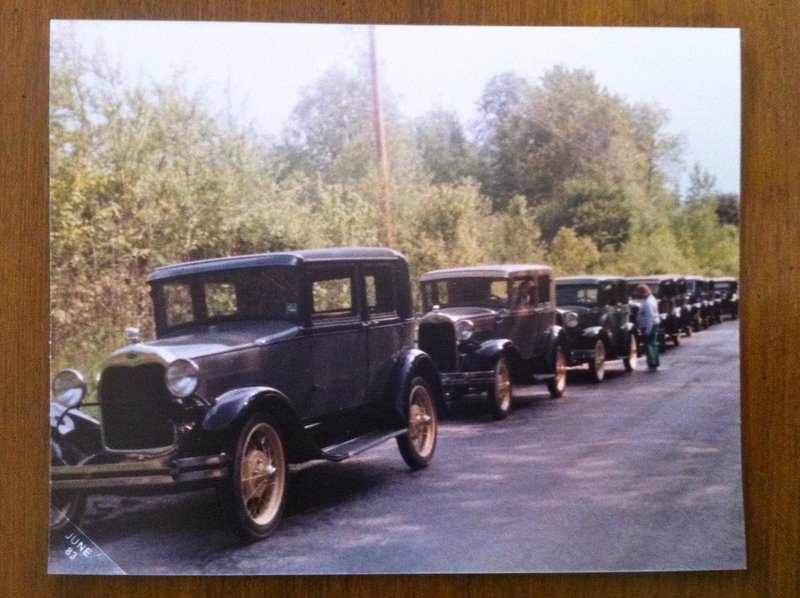 My grandfather collected antique cars and at one point had about 7 different kinds of them. I grew up around those cars and the people who liked to tinker with them. 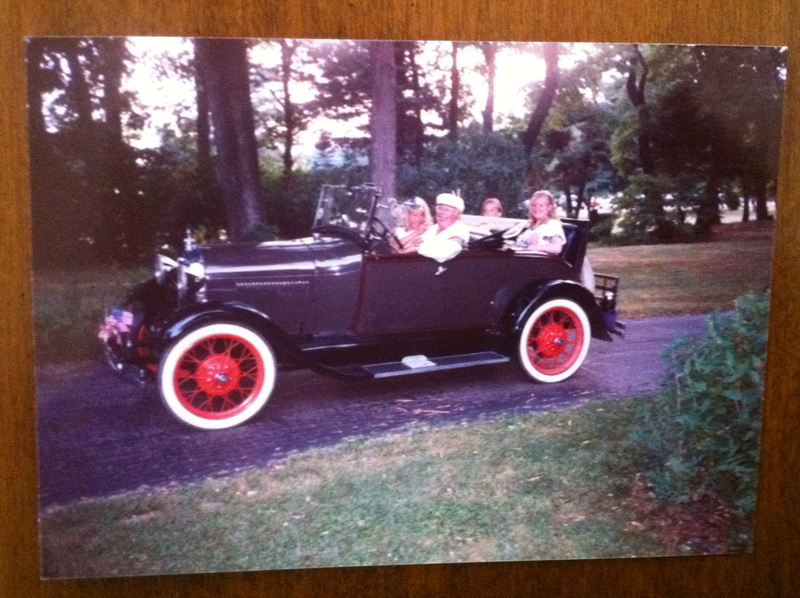 My grandparents would take us on week long trips around Pennsylvania and New England with the Model A club they belonged to. The first car I ever drove was a Model T Ford when I was 12. I loved riding around in those cars. People would talk to you wherever you went and want to learn more about the cars. 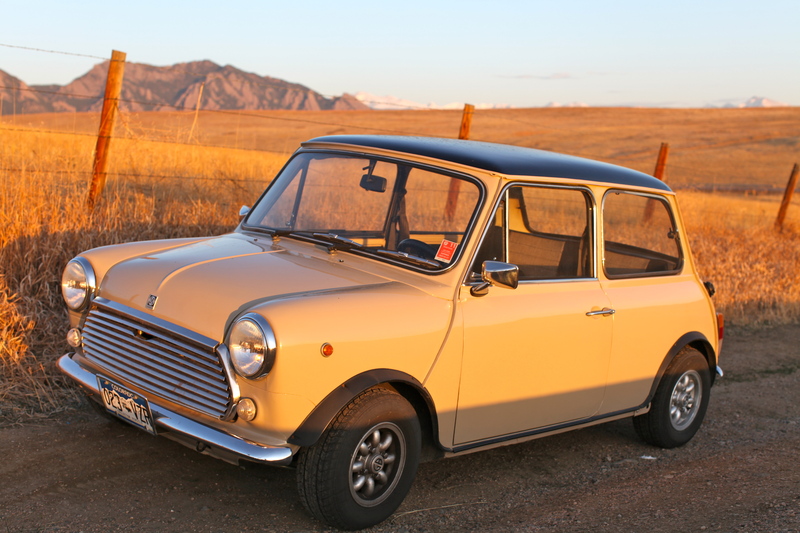 When I moved to LA a few years ago I was back in a place that loves classic cars and after my lease on my Audi was up I bought my very own, a 1973 Mini Innocenti. It is an Italian version manufactured by Lambretta. “Little Buddy” has his quirks (like not running in the rain) but overall has been a loyal friend. When I bought Little Buddy I was buying him more for looks and something fun to drive than for convenience. When you have a classic car it’s important to get to know each other a bit. Aside from aesthetics, classic cars really do have their own personalities and hang ups. This week I’d like to learn how to work on my car a bit so I know how it works a little better. I’ve talked with my mechanic and he’s agreed to let me come in and learn how to do some of the routine maintenance on my car. While I’ve learned a lot about technology over the past decade or so, I am not the most mechanically inclined person. I think it will be interesting to learn how something so near and dear to my heart actually works. I think my grandfather would also be proud. You are currently browsing the 44 old car category at 52 To Do.